Kapamilya network remained dominant in Kantar Media but Kapuso inching more closer in AGB Nielsen. That is the story of the latest data from Kantar Media and AGB Nielsen surveys covering the week of October 30 - November 5, 2017. The Good Son of ABS-CBN and My Korean Jagiya of GMA Network. Coco Martin's "FPJ's Ang Probinsyano" is still unbeatable in all ratings groupings for both Kantar and AGB Nielsen. 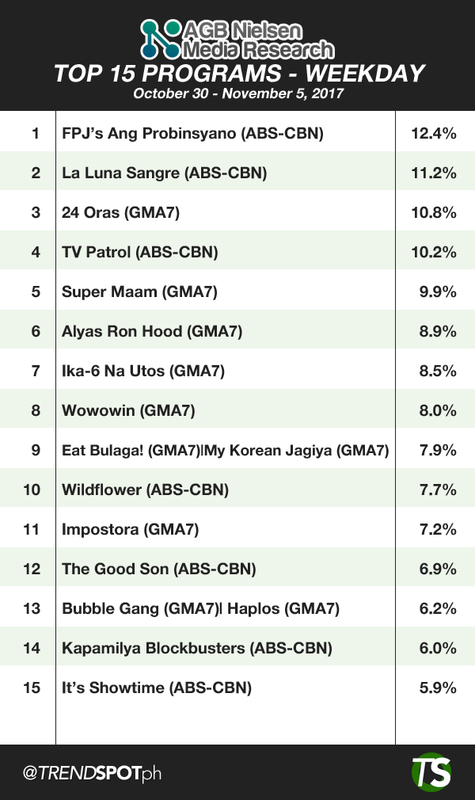 Ang Probinsyano is number one in Overall ranking of both Kantar and AGB with 39.1% and 12.4% ratings respectively. 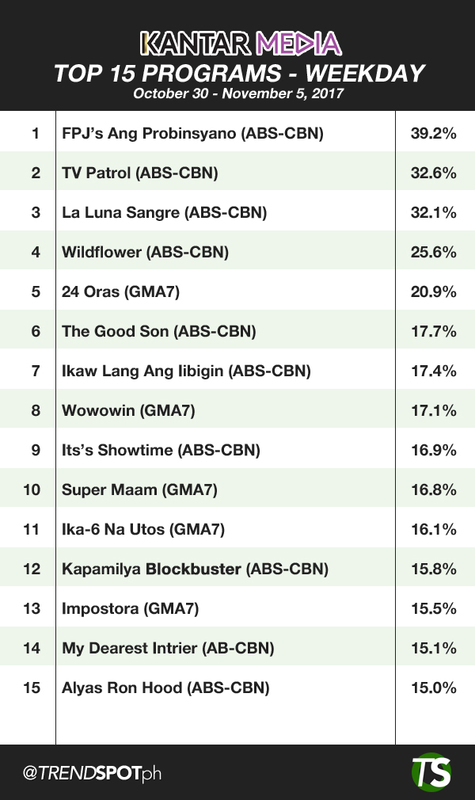 The action-drama teleserye also topped both weekday ranking with the same ratings number of 39.1% and 12.4%. 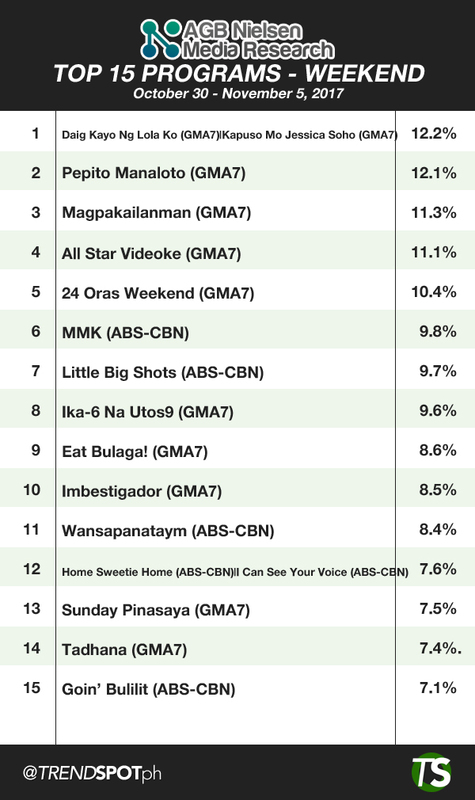 For weekend ranking, the 2 survey firms are split as Kantar hailed ABS-CBN's Little Big Shots as the number one program with 30.3% ratings while AGB Nielsen crowned Daig Kayo Ng Lola Ko and Kapuso Mo Jessica Soho as the most watched programs with equal ratings of 12.2%. If ABS-CBN continues to dominate the Kantar rankings, AGB Nielsen board showed steady improvement by GMA7. While Ang Probinsyano is undisputed in the top spot, Kapuso shows followed closely in the next spots. 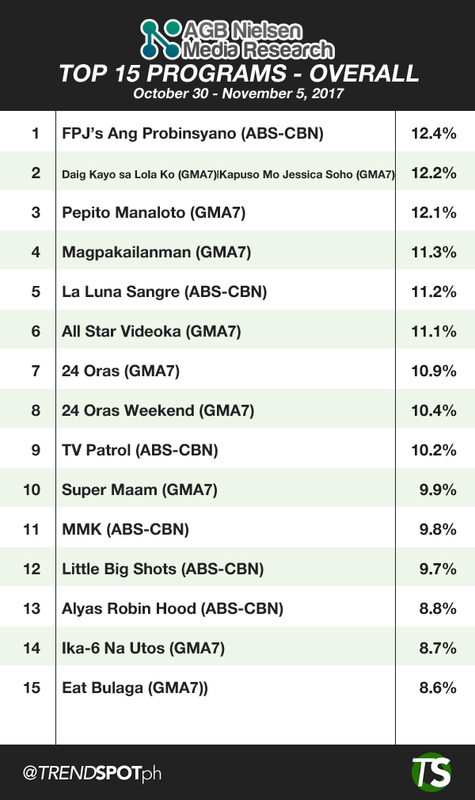 For overall rankings, GMA7 programs took the number 2 to 4 spots with Daig Kayo Ng Lola Ko and KMJS posting 12.2%, Pepito Manaloto with 12.1% and Magpakailanman scoring 11.3%. AGB Nielsen Weekday and weekends ranking on the other hand showed a more telling story for GMA7. For weekday, GMA7 took 10 spot out of the top 15 programs. 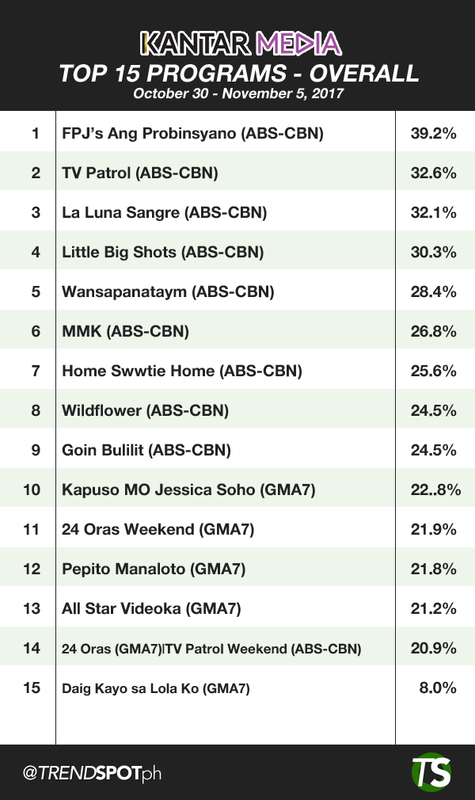 The 3rd, 5th - 10th, 12th and 14th -15th ranks were all occupied by Kapuso shows, giving only 5 spots for ABS-CBN; the number 1, number 2, number 4, 11 and 13 ranks. Weekend is more victorious for Kapuso are it took the number 1-5 spot led by the tied Daig Kayo ng Lola Ko and KMJS. 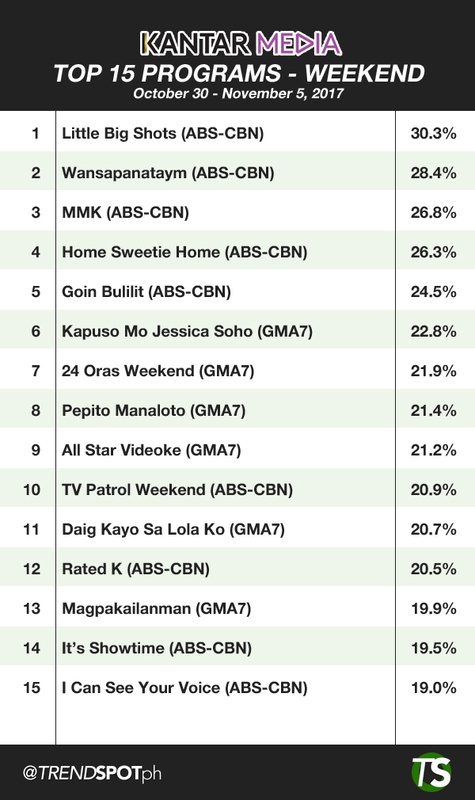 Meanwhile, here are the top 15 programs from Kantar Media and AGB Nielsen NUTAM People ratings.